You fill the portable storage containers at your leisure- take as long as you need; an hour, day or week. Our flexible schedule fits the demands of your life; a noticeable benefit over renting a truck. 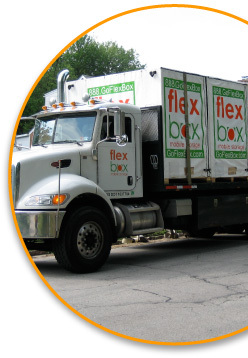 With our Flexpress program you pay one flat moving fee and won’t accrue any additional storage fees. We can even ship your FlexBoxes anywhere in the country! A FlexBox Fits Nearly Anywhere! FlexBox provides portable storage containers that fit in more places than other mobile storage options. Tight alley ways, parking spaces, on your deck or patio, even downtown—in front of a parking meter. Another way FlexBox provides you with flexible moving and storage options. Our FlexBoxes measure 8’x5’x7’ so you don’t have to pack Dad’s greasy tools with Grandma’s antique clock. When you use our portable storage containers, every room can be packed separately!